October | 2012 | Australian Climbing Association (Qld) Inc. The ACAQ Code of Conduct can be found here. This document was presented at the first quarterly meeting following incorporation, and I believe, was seen by land managers as an important first step for the fledgling society. All credit goes to Adam Gibson for getting this document 99% right at the first draft. A key test I like to apply to any item of policy is whether or not it has the potential to divide the climbing community. I believe that no matter how common sense, or how well intended a policy might be, if it is by nature divisive, then it will inevitably do more harm than good. With that thought in mind, it is clear that articulating a code of conduct for climbers is going to be fraught with such hazard. Yet, if the climbing community is to present a believable interface to the managers of the public estate, it is clear that the whole enterprise won’t get off first base without an unequivocal statement of the community values we share. In a nutshell, the code of conduct calls for respect – respect for the crag environment, respect for land managers, respect for other climbers and finally respect for other users of the space. Framing things this way, I believe, defuses issues that could be contentious. Climbing ethics is the one topic guaranteed to divide the community, and thus is an area where ACAQ cannot express an opinion on the value of one style versus another. The Code of Conduct deliberately skates around the issue with vague phrasing that makes a respectful head nod to local ethics, best practice, and environmental impact, but ultimately makes no specific demands. Although the code of conduct avoids the issue of climbing ethics, ethics as they delineate climbing styles, are an issue that ACAQ cannot afford to ignore. This is especially so when considering the development and subsequent management of a particular crag, where the style of climbing it best provides should be a major policy determinant. I believe that not only is it something that will evolve naturally, but also it is sound policy for each crag to have its own local rules that extend our generic code of conduct. And because bolting is a major determinant of climbing style, it is inevitable, and reasonable, that such local rules will proscribe certain practices with respect to bolts. The officers of QPWS work to a set of regulations derived from the Nature Conservation Act 1992, along with other articles of the Qld legislative corpus. Our code of conduct, on the other hand, including such local crag rules as we might recommend, arise purely from the aspirations of the climbing community. In an ideal world, “QPWS rules” and “ACAQ rules” would line up exactly. However, in the real world, this is unlikely to be the case and I would consider a 90% overlap to be a major public policy achievement. The above statement should not be taken to mean ACAQ endorses contravening QPWS rules when they don’t align with ours. Rather, what I’m saying is that these are areas where work needs to be done. After all, we would be failing in our purpose if we didn’t highlight those areas where the regulations fail their primary purpose of serving the public good. Once again, this last statement should not be taken to mean that we believe climbers can act in whatever way they feel justified within the public estate. Clearly, the public good is inclusive of all stakeholders, not just the climbing community, and the code of conduct covers this ground in the broadest sense. The role of the ACAQ is to listen, negotiate and recommend. It is not to enforce. I believe that to rely on enforcement is to fail – this being true regardless of whether it is ACAQ or QPWS attempting the enforcement. If for no other reason, enforcement is simply not practical given the nature of the landscape – will the public purse run to an enforcement officer for every boulder in Girraween? If we are not to watch the Tragedy of the Commons slowly and inexorably unfold, then the climbing community need to be self-policing. The challenge for ACAQ is to listen, negotiate and recommend such that the majority of the community will have no qualms donning the cloak of stewardship. 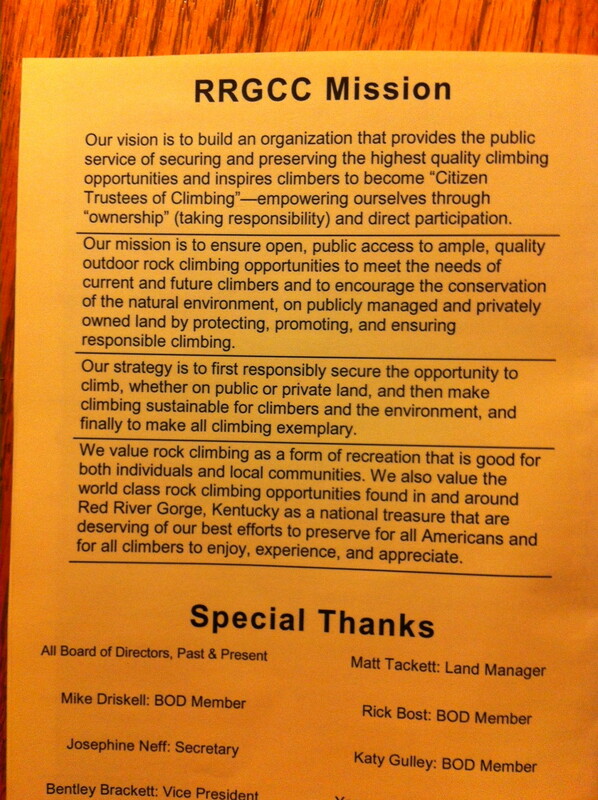 Such rules as we recommend should do no more than articulate what the majority of climbers want for their crags. By what authority does ACAQ act? That’s easy to answer – we have none, but that invested in those who are prepared to stand up and be accountable for their actions. The vast majority of our crags are on the public estate, and, if you want to influence what happens there, firstly you need to stand tall and publicly state what you think. Secondly, you need to frame your argument as a statement for the public good. Thirdly, you need to be happy to engage the government apparatus by which the public estate is managed. The ACAQ is a legal entity set up by concerned individuals to meet the above aims. Currently it is the only channel by which climbers can influence management decisions. If you want a say in this process then join the association and vote – the authority comes from you, the ACAQ member.